Games Workshop is still claiming to own the trademark to "Space Marine." Time to get pissed off. Back in December, when Games Workshop first got M.C.A. Hogarth's Spots the Space Marine novels pulled from Amazon.com, claiming to own the trademark for "space marine," this seemed like a misunderstanding. Or an overzealous legal department. 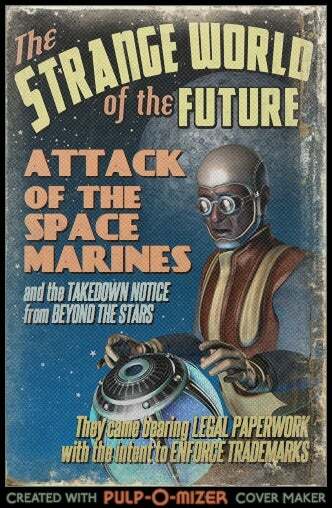 After all, the term "space marine" goes back to the 1930s and has been used by Robert A. Heinlein and others. Games Workshop gets someone&apos;s book yanked from Amazon for using the term "Space Marine"
In their last email to me, Games Workshop stated that they believe that their recent entrée into the e-book market gives them the common law trademark for the term "space marine" in all formats. If they choose to proceed on that belief, science fiction will lose a term that's been a part of its canon since its inception. Space marines were around long before Games Workshop. But if GW has their way, in the future, no one will be able to use the term "space marine" without it referring to the space marines of the Warhammer 40K universe. I used to own a registered trademark. I understand the legal obligations of trademark holders to protect their IP. A Games Workshop trademark of the term "Adeptus Astartes" is completely understandable. But they've chosen instead to co-opt the legacy of science fiction writers who laid the groundwork for their success. Even more than I want to save Spots the Space Marine, I want someone to save all space marines for the genre I grew up reading. I want there to be a world where Heinlein and E.E. Smith's space marines can live alongside mine and everyone else's, and no one has the hubris to think that they can own a fundamental genre trope and deny it to everyone else. At this point I'm not sure what course to take. I interviewed five lawyers and all of them were willing to take the case, but barring the arrival of a lawyer willing to work pro bono, the costs of beginning legal action start at $2000 and climb into the five-figure realm when it becomes a formal lawsuit. Many of you don't know me, so you don't know that I write a business column/web comic for artists; wearing my business hat, it's hard to countenance putting so much time and energy into saving a novel that hasn't earned enough to justify it. But this isn't just about Spots. It's about science fiction's loss of one of its foundational tropes. - Or to have the public support to encourage Games Workshop to contact Amazon and tell them I am no longer infringing on their trademark. Amazon won't re-instate the e-book without their okay. When I called Games Workshop and pointed out previous books using the word "space marine," they told me their grounds for complaint was based on the European trademark (which is not valid in the US). I explained that, and was told they believed their publication of novels and e-books awards them a common law trademark in America. This would only work if there weren't other authors predating them who had used the term — they're the ones, then, that would have the right to the common law trademark. Judging from the comments on Hogarth's Livejournal post (identical to the blog post linked above), lots of people are getting incensed about this and talking about getting bigger guns involved — possibly including the Science Fiction and Fantasy Writers of America. And some big-name authors who use space marines in their work. For now, though, Hogarth wants you to spread the word.